Auto Auction of New England began in January of 1995 by the DeLuca Family. The Family began owning automotive dealerships over 50 years ago, and, using their knowledge and interest in automobiles, recognized the need for an Independent Auto Auction and seized the opportunity. They have also since expanded to eleven new vehicle franchises. Both their franchises and auction serve all of the Northeast. The family also owns Auto Use, a leading Independent Finance Company and Bank of New England. Auto Auction of New England’s main office building sits on over 32 acres of land and is surrounded by thousands of vehicles. The Auction offers transportation services to move vehicles to or from anywhere in the New England area. Auto Auction of New England will also assist in arrangements for transportation to anywhere in the United States. They offer post sale inspections for seven days or 100 miles after the sale, whichever comes first. They also provide post or pre-sale detailing services. Auto auctions take place every Thursday morning at 9:15 AM. Six lanes of vehicles are lined with between 1,200 and 1,500 vehicles weekly. These vehicles range from cars, trucks and SUV’s to heavy equipment and recreational vehicles. The vehicles are graded on a “light system.” A blue light means the vehicle will be sold with the “Title Attached,” requiring the title to be sent to the Auction by the subsequent Thursday and the buyer is warned not to sell the car until the title is received. A green light means the car is being sold with no defects worth over $500. A yellow light means the vehicle is sold with defects that are known to both the Seller and the Auction and must be announced upon auctioning. Some of these announcements include structural damage, flood vehicles, mileage over 100,000, over 200,000, etc., reassigned VIN and engine change. A red light vehicle means the car is sold As Is, and unconditional of any defects or repairs that may need to be done. Like to take your own aerial tour of AANE? Click the play button to start your flight. These images are by the parent company of Londonderry Hometown Online News, ImageAbility Inc. You can learn more about this Aerial Imaging Service on our website. Contact Auto Auction of New England at (603) 437-5700. 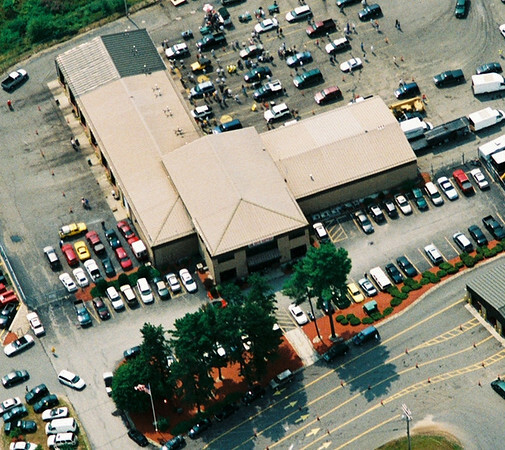 Auto Auction of New England is located off Exit 4 in Londonderry, NH. Browse this Google map for detailed directions.